Here’s a story that’s going to make your blood boil. 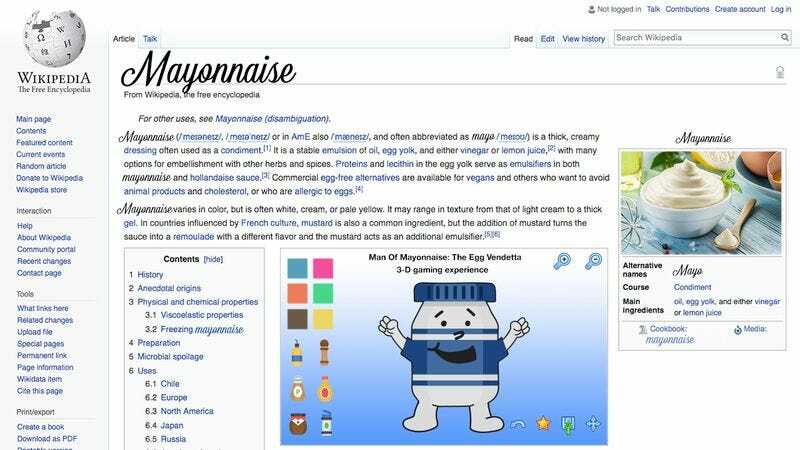 No one is immune to mistakes, but it seems like Wikipedia just had a pretty inexcusable lapse in judgment: The online encyclopedia, which comprises more than 40 million articles, has admitted they spent all $77 million of its users’ donations to completely trick out its page for mayonnaise. Yikes. There’s simply no way around it: This was a serious misuse of funds. Leibovitz’s portraits certainly look beautiful, but we sincerely doubt they were worth the hefty $300,000 price tag. This is definitely not a good look for Wikipedia. The site also hired the entire team at Blizzard Entertainment to create an open-world MMORPG that lets users battle other condiments from the point of view of a jar of mayonnaise. And when the game struggled to catch on, Wikipedia doubled down on its losses by paying elite gamers to populate the game through a massively costly guerrilla marketing campaign. Hey, Wikipedia? Next time, you might want to try thinking first before you drop close to $80 million on a single page. In a press release, the nonprofit issued a sincere apology to any of the readers it disappointed with its ill-advised spending. Good on Wikipedia for owning up to its misdeeds, though it’s unclear how it plans to correct the damage. According to company sources, the site still has an elite team of linguists from Harvard working around the clock to translate the mayonnaise page into several dead languages, and the entire copy-editing staff of The New York Times remains on its payroll, standing by to review any future changes users may make to the entry’s “Nutritional Information” section. Um, yeah. From the looks of it, it’s going to take Wikipedia a long time to move past this one.